Hotel registration forms are used by the hotels and resorts in order to keep all the information of their visitors. The visitors have to provide their detailed information such as name, phone number, residential address, the mode of payment and so on. These forms are filled out by the visitors in order to confirm their reservations of the hotel rooms and other facilities of the hotel. There are some variations in the registration forms of the hotel. 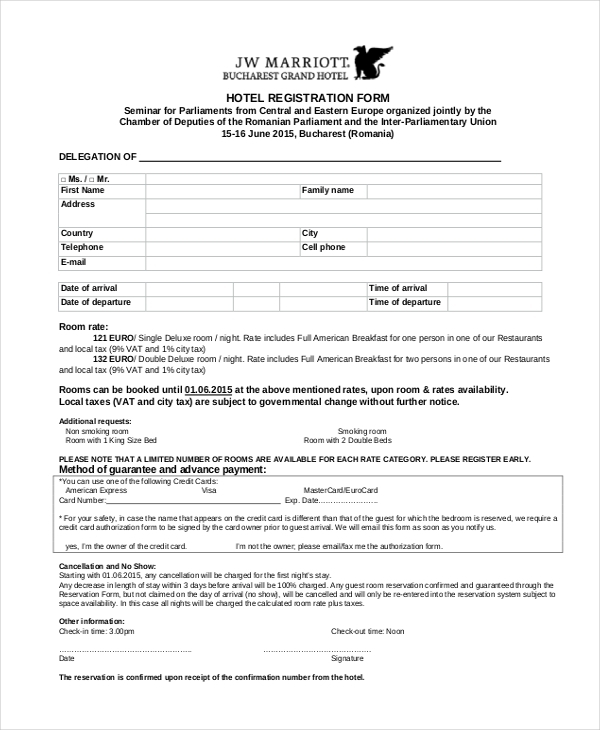 Individuals fill out this form and give it to the travel agency. The travel agency will book the hotels according to the requirements of the clients. The clients need to provide some basic information in this form such as the number of the visitors, the name of the visitors, the payment mode, the choices of the hotels, the preferences of the rooms and so on. They need to fill out the forms and send it to the concerned travel agency as soon as possible so that the agency takes quick initiatives. 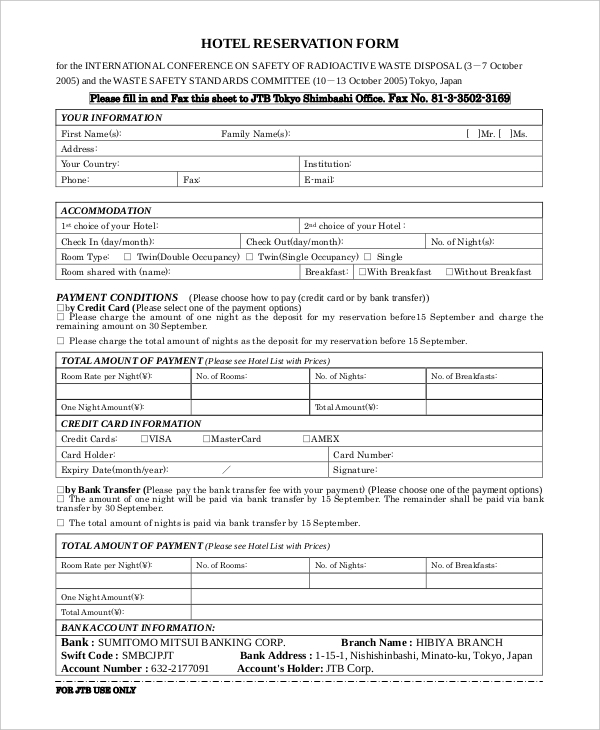 If any individual wants to take part in any meeting or conference of a hotel then he/she has to fill out the hotel registration card and submit it to the hotel authority. The user has to provide certain information such as the name of the country, the address, the purpose of his/ her participation in the meeting. 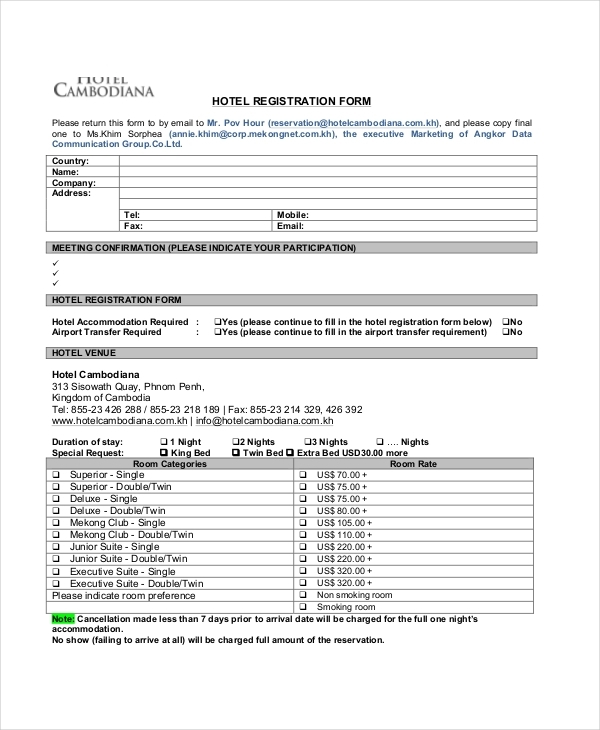 Blank hotel registration form is used in almost every hotel. The visitors of the hotels have to fill out the form. The visitors have to provide certain basic information such as their name, address, phone number, date of arrival, and the date of departure and so on. An individual needs to fill out a hotel check-in registration form at the time of checking in. The individual has to fill out certain information such as their full name, address, the name of the city where they live, the postal code of their location, email address, the arrival date, the departure date and so on. They also have to describe their mode of payment via this form. 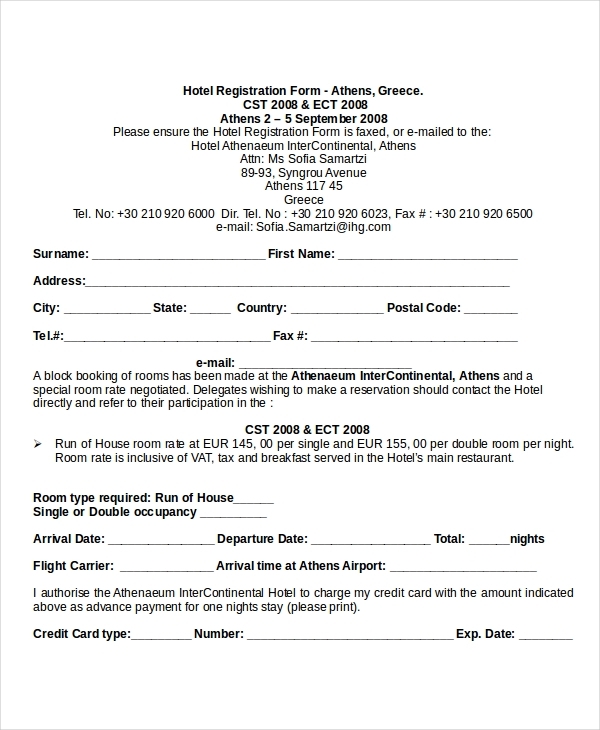 A hotel registration form is used for the reservation procedure of the hotel rooms. The customers have to fill out the form. They have to mention the type of the room they need, the date of arrival, the date of departure, their basic information such as name, address, location, cell phone number, and email id and so on. The hotel metropole registration form is the room reservation form of metropole hotel. The form needs to be filled out by the customers of the hotel. The customers have to provide some basic information such as their full name, address, cell phone number, country name and code, country ID, email id, the date of arrival, the date of departure and so on. The customers have to fill out this form in order to confirm their room reservation. This registration form is used in the time of the check-ins. 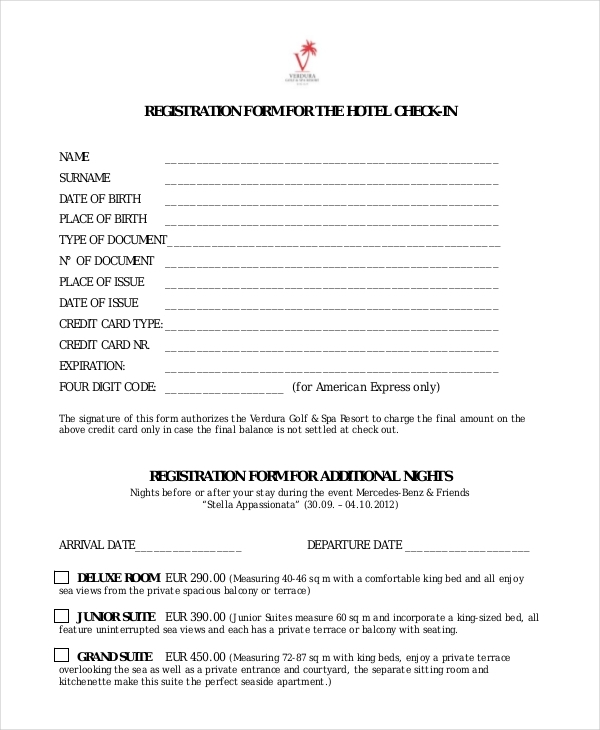 The hotel authority can charge the unpaid amount from the visitor by signing the form. The form contains fields such as the name, surname, and date of birth, place of birth, the type of document, the place of the issue, the date of issue, the type of credit card and so on. 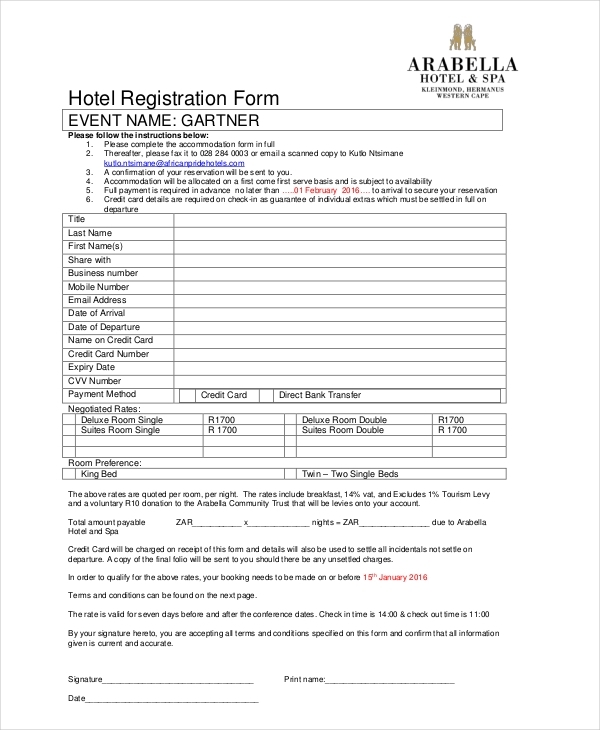 The registration and hotel booking form needs to be filled out by a visitor. He/she needs to make sure to read the form very well before completing the form. Any kind of registration has to be guaranteed by the exact and proper payment. The data of this registration form is used to issue the invoice of the visitor. 5-star hotels use a special kind of registration form which is known to be the 5-star hotel registration forma. 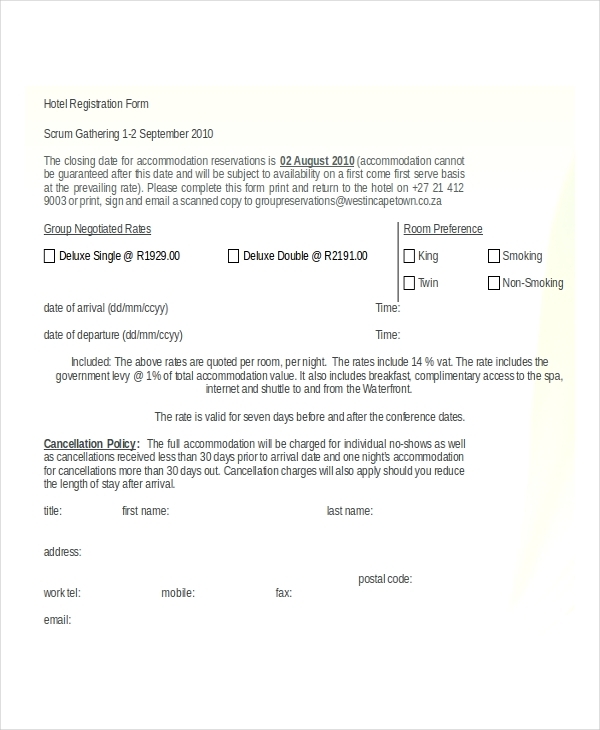 The visitors need to fill out the form in order to confirm their reservation of the rooms and other facilities. They have to provide some basic information such as their names, address, phone number, credit number, the method of payment and so on. 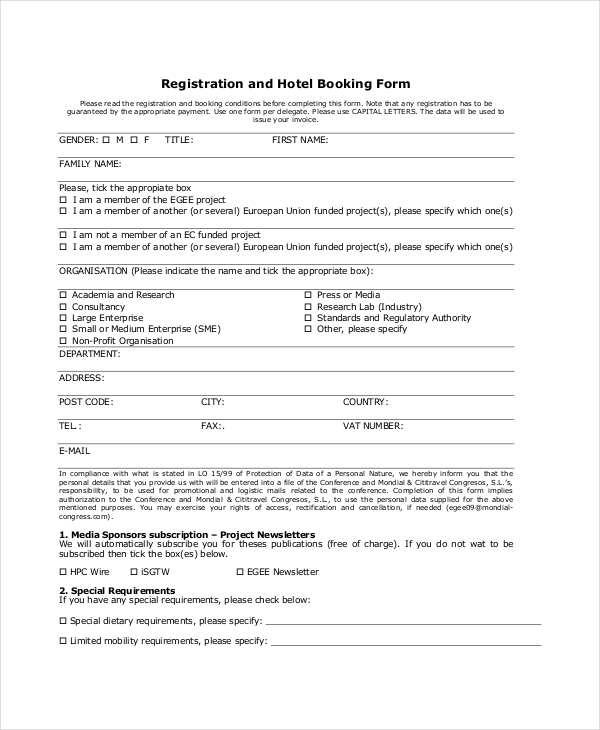 Why Does a Hotel Need to Have a Properly Drafted Registration Form? Hotels and resorts are meant for relaxation and recreation. People take a break from the daily tedious work routine and go to vacations with their near and dear ones. It is true that people opt for a vacation to be free from the rules and regulations of daily life for a specific amount of time. But the hotel and lodging facilities are also doing businesses. So the hotel authorities need to have certain rules and regulations in order to provide the clients with their facilities in a smooth manner. That is why they need to maintain a certain amount of documentation when it comes to maintaining the information of all the visitors and running the hotel business smoothly. Keeping all the information of the visitors is very important for the hotel authorities. What are The Steps of The Procedure of Guest Registration? The guest should always be treated well at the time of registration for the reservation of hotel rooms. The front desk executive of the hotels has to welcome the guest in a perfect manner. After that, the executive needs to observe the check-in list for the name and other personal details of the guest. The details need to be related to the registration procedure of the guest. After making sure that the guest has arrived at the right time, the executive needs to provide the guest with the guest registration card and lease agreement (if the hotel has anything). The guests have to fill out the registration card. The registration cards are used to ensure that the reservation procedure has been done in the perfect manner. What Kinds of Information Does a Registration Card Contain? The purpose of the guest registration card is to record the essential information of all the guests. The basic personal information such as the name of the guest, the address, the phone number, the email id, the mode of payment etc., are needed to keep a proper track of the guest list of the hotel. What are The Steps to Finalize The Registration Procedure of a Hotel? The concerned staff of the hotel needs to request the credit card of the guest in order to check the status of the payment. The staff has to make sure that the payment is been done properly. The hotel authority also has to request the passport or other photo ID proof of the guest. The photo ID proof is required to complete the basic verification procedures of the hotel. After verifying all the details of the guests, the hotel authority can proceed to welcome and take care of the guest. 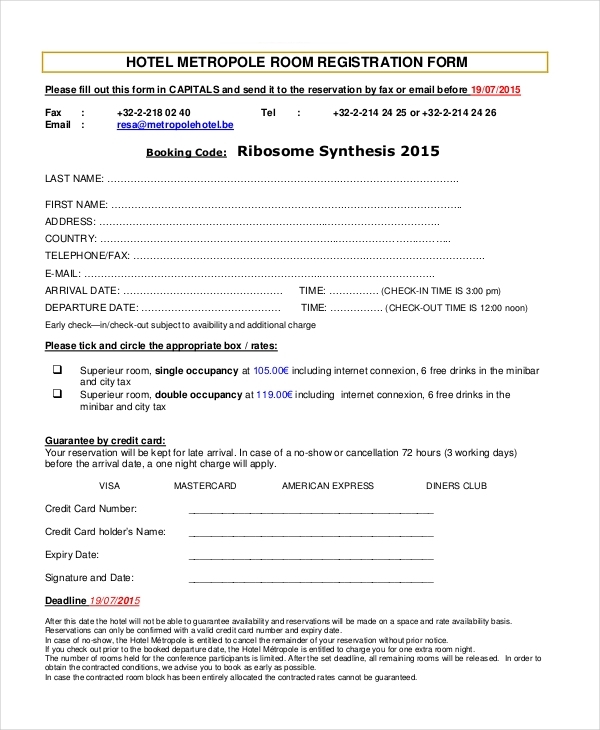 Anybody can get the hotel registration form by easily downloading it from our website. You can also print the forms or edit the form as per your requirement. You can easily modify the pattern of the forms. If you are facing any problems while modifying the form, you can contact us. We are always there to help you. From our websites, you will get error free and well-designed forms which are perfect for catering all of your needs. These forms come in both PDF and Word document format. You do not need any other software to download these forms. These forms come in very simple language. So anyone can understand the contents and anyone can easily fill out these forms. The web versions of the forms have both lower and higher compatibility mode. If you need any further help regarding these forms, you can easily contact us. What are The Other Duties of a Hotel Authority? After checking and verifying all the personal details of the guest, the hotel authority needs to focus on serving the guest with utmost care. The hotel authority has to check out the basic requirements of the guest. The guest relationship executive has to ask the guest whether he/she needs the newspaper service, the car parking facility, broadband connection or anything else.